Maybe you know it, maybe you don’t: one of the characteristics of the songs of the Pygmies, the forest people of Central Africa, is yodel and vocal polyphony. The subject is vast and there are a lot of things to be said. After Jimmie Rodgers and his coversongs, I would like to introduce a new serie about Pygmy music, then and now, traditional and contemporary and all the influences it had on jazz, rock and other styles. It will be an historical / geographical approach: who were the field recorders (a subject I’m really interested in), where did they record, what was their influence on other people. Saying this, I think I should begin with Colin Turnbull, who inspired Simha Arom to make recordings. 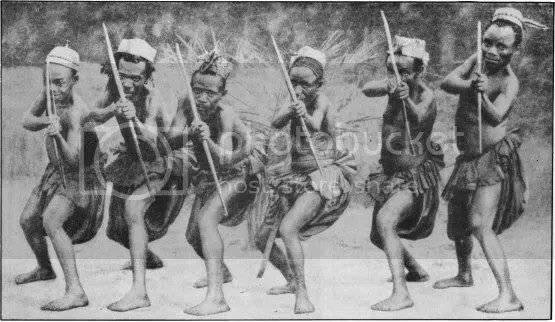 But there are older recordings and I could begin with that too… There are lots of things to write about I could dedicate a whole blog to Pygmy yodels ! Pygmies can be classified into different groups but it isn’t very clear to me because the Wikipedia page says one thing and books say other things. But important ethnies are the Aka in the Central African Republic and in DR Congo, the Ba-Benzele from the Central African Republic, the Baka from Cameroon, Gabon and DR Congo, the Mbuti (with different sub-groups) from the Ituri forest in DR Congo, the Twa from Rwanda (essentially). They speak languages that are belonging to different families. What is common to them, besides their small stature (even if that is not really true anymore today because of interbreeding), is that they live from gathering and hunting in the equatorial forest. Today they are approximately 200 thousand but the deforestation is a danger for their traditional way of living and they are forced to sedentarize and live as farmers. To complete this post, here is one of the first recordings of Pygmies. 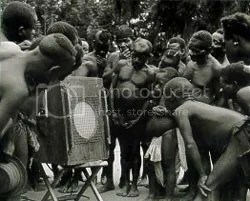 The Efe Pygmies (from the Mbuti group in the Ituri Forest) were recorded on wax cylinder by Armand Hutereau between 1909 and 1912. He was sent in Northern Belgian Congo by the Belgian governement to describe the ethnic people of the region. These cylinders are the oldest recordings of pygmy music for all Central Africa. Even if the quality of the sound is not very good, you can hear the yodels and vocal polyphony. Antoine Kalosoyi, known to all as Wendo Kolosoy, was born in 1925 in northwestern Congo, then under Belgian colonial rule. He became an orphan in his early childhood and was taken to live with the Christian Brothers where he began to sing and play guitar. Expelled by them because of the lyrics of his songs, he became a professional boxer and worked as a sailor but soon started a career as singer in the mid 40s with his band, Victoria Bakolo Miziki. His first succes came with Marie-Louise in 1948, a song he would re-record many times. He was the first superstar of Congolese music and the founder of the Congolese rumba. He decided to stop performing in the 60s because of the political situation of the country and because he didn’t want to sing praises of Mobutu. In the 90s, he restarted his career and recorded new albums, a bit like the Buena Vista Social Club. He died on July 28, 2008. AW: So did you already [in the 50s] have that high head voice, then? Your trademark yodeling sound? WENDO: Yes. To find this voice was not easy. Lots of people were after me to know how to do that, even poor [Grand] Kalle. 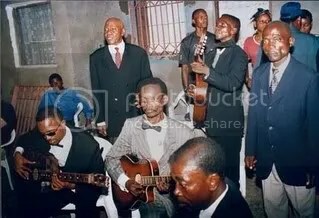 So here are songs recorded in 1999 in Abidjan (Ivory Coast) and in 2002 in Kinshasa with the remaining members of his old orchestra, Victoria Bakolo Miziki. It were favorable sessions for yodels it seems, I found most of them in these songs. I included two older versions of songs as example of his early style but they don’t contain any yodel. You are currently browsing the archives for the DR Congo category.